Volvo has released a new commercial, featuring the new XC60 Luxury SUV and inviting you, now through January 3rd, to enjoy no payments until March. “Bring out the old, bring in the new. Bring happy bells across the snow. Years going let them go. Bring out the false, bring in the true. 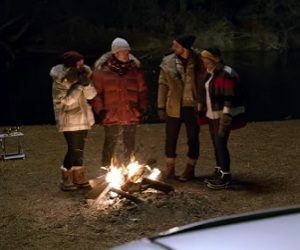 Bring in the love of truth and right”, says the voiceover in the 30-second spot, which features a group of friends celebrating the New Year’s Eve on the shore of a lake or a river, near a fire, with music playing in a XC60 SUV. “Goodbye, 2016. New Year, New Volvo. Get Three Months on Us” – are the final onscreen lines.